Welcome to Wine Quiz number Nine. Please choose from the list of possible answers to each question. Amarone is a special wine, made with partially dried grapes, from the north east of Italy. Wachau is one of Austria’s most important regions, especially for Riesling and Gruner Veltliner. This is the wine brand of pop singer Cliff Richard, from the south of Portugal in the Algarve region. These tartaric crystals are tasteless and harmless, and very occasionally can be found in white wines. 5: The science of winemaking is known as what? Oenology – sometimes spelled Enology – is the science of winemaking. 6: which estate makes the ‘Art Series’ Chardonnay? The Art series is one of the labels of Leeuwin estate in Margaret River, Western Australia. 7: where is this famous wine landmark? 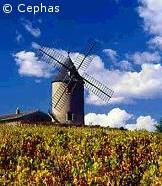 This is the famous ‘moulin’ or windmill in Moulin-a-Vent, Beaujolais. 8: which wine takes its name from the cold conditions in which it grows? This very expensive wine is made in the South of France by Clos des Fees. 9: which is a synonym for the grape Nebbiolo? Spanna is one of several synonyms for the Nebbiolo grape of Piemonte in northwest Italy. 10: which vineyard region lies at 45 degrees South? Though some vineyards in Chile and Argentina are not too far off, Central Otago lies at 45 degrees south. 11: which of these wines has typically only around 5% alcohol? The light, sweet, frothy wines of Moscato d’Asti are extremely low in alcohol – but delicious. Champagne is one of the world’s most northerly wine regions. Roussillon runs all the way to the Spanish border. 13: Which wine region is this? This is the Mosel Valley in Germany, not far from Frankfurt. 14: European vineyards are measured in ‘hectares’. How many acres to the hectare? A hectare is roughly 2.5 acres. 15: which is NOT a Burgundy Grand Cru appellation? Vosne-Romanee is a relatively lowly village appellation, though the village area does contain many Grand Cru vineyards. 16: The Canteiro method produces which type of wine? Canteiro is a traditional method of ageing Madeira wines in the hot lofts of wineries. 17: Who or what is ‘Boyszone’? Kim Crawford winery produced wines from the Boyszone vineyard – not to be confused by the Irish boy band, Boyzone. 18: which claims to be the oldest continuously operating winery in the Napa Valley? The Beringer winery makes this claim, having begun making wine in 1884. 19: Who grew grapes at Monticello? Thomas Jefferson grew grapes to make wine in the grounds of his Virginia home, Monticello. 20: Who or what is Henry of Pelham? Henry of Pelham is a winery in Canada’s Ontario Province.